Healthy Baked Sweet Potato Tater Tots that for an easy paleo and vegan veggie dish! Low key obsessing over this recipe right now. I didn’t think the healthier tater tots would exists. And I definitely did not think they would be crispy without frying them, but today we are making healthy BAKED Sweet Potato Tater Tots. I am still scratching my head over the fact that I spent the first chunk of my life not into sweet potatoes. My mom says I loved them as a baby but unless I was munching on hash browns or curly fries, potatoes weren’t really my thing. These days I have been making all the things sweet potato like savory waffles and crispy fries every week. And now these healthier baked tater tots are going to be on the rotation. What I love about these is that they are almost too easy to make. You only need a few ingredients that you likely have on hand already since they are cooking staples and it’s not a huge mess in the kitchen. 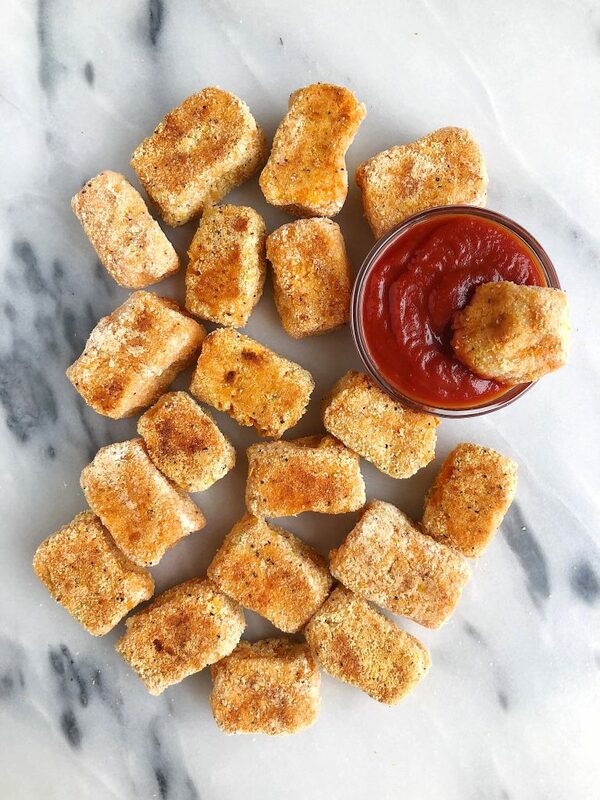 These tots are also vegan and paleo-friendly. All you need are 2 medium sweet potatoes, almond flour and a few spices! Plus you will need Sir Kensington’s Ketchup for dipping. 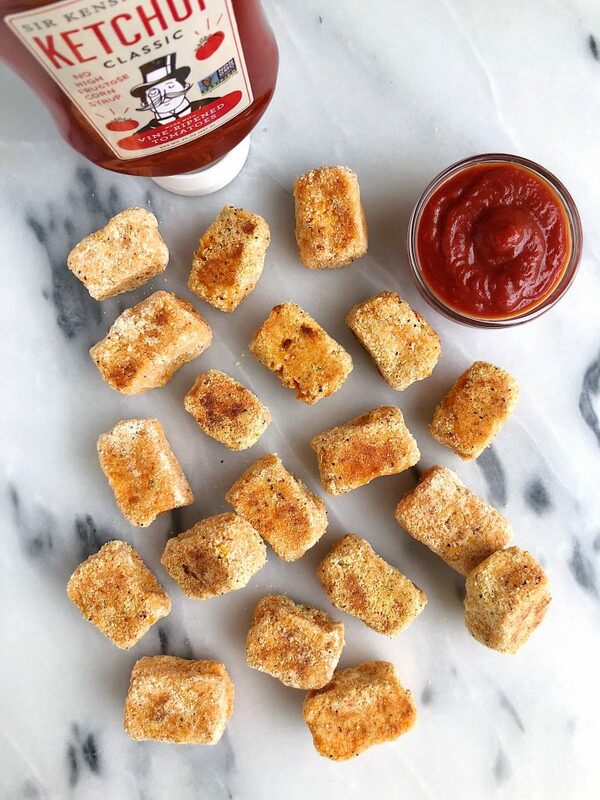 What’s a tater tot without ketchup, right?! 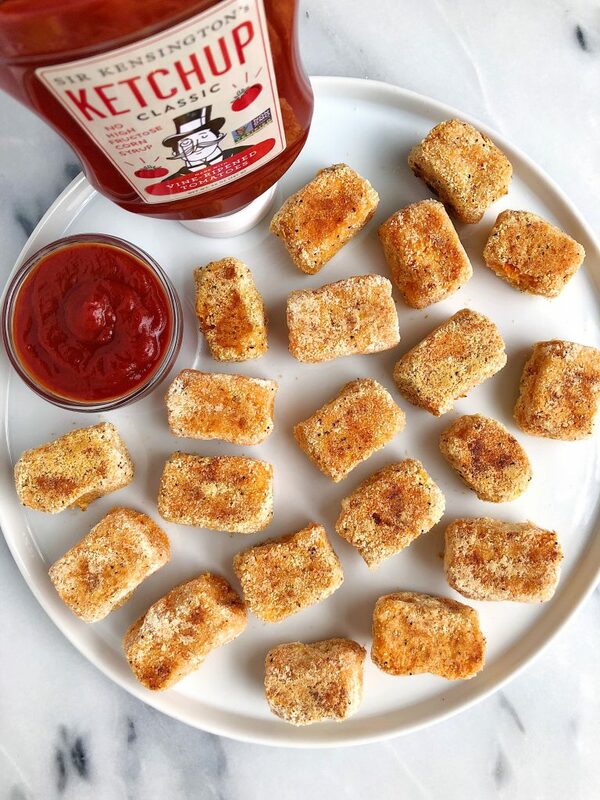 I served Sir Kensington’s and their fabulous squeeze bottle ketchup with these healthy baked Sweet Potato Tater Tots. I always have Sir Kensington’s products on hand but especially their ketchup. It doesn’t have any high fructose corn syrup (ya, most ketchups do!) and they start with real tomatoes! They’re non-GMO verified and you can get fancy with their glass bottle or use the squeezable one. Plus they have a spicy ketchup, Jalapeño Heat, if you want to get really crazy when you enjoy the tots! Sir Kensington’s has been an amazing brand partner of mine for the past year and I have some delicious things coming out featuring their products this year. They also have some exciting new products launching that I cannot wait to share with you so soon! 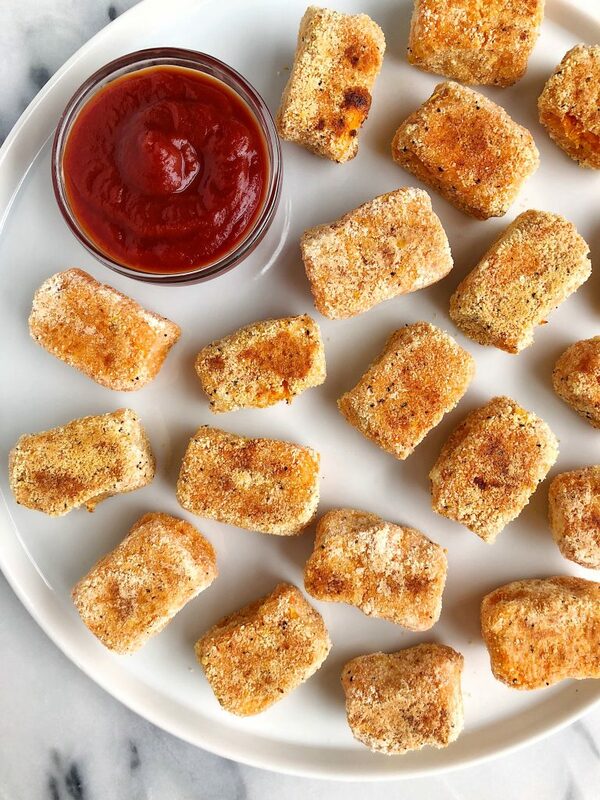 But in the meantime, enjoy these Sweet Potato Tater Tots and their fabulous ketchup for dipping! Sir Kensington's Ketchup for dipping! Enjoy with Sir Kensington's Ketchup! Thank you Sir Kensington’s for sponsoring this post. It means so much to me to work with brands I love and believe in to support the blog! Any suggestion for an almond flour substitute? I have a nut allergy, and am often unsure what to use in its place that will be an adequate substitute in terms of cooking and consistency. Hey! So you leave the skin on for this? Or peel them first? Thanks! These look amazing! Yes! just wash the skin first! Oh my gosh these sweet potato tots look so good. LOVE LOVE. I really like how easy they are to make. These look AMAZING! Going to try them this weekend! Any suggestions for saving/storing leftovers or are they best just eaten same day? Is the yeast a necessary ingredient? How would these turn out without? they’d work without. it just adds flavor!